This is an adaptation of Connemara Soup from the Simon Pearce Restaurant in Vermont. A rich tomato soup flavored with bacon (or as I did today, Corned Beef) and brimming with tomato, potatoes and healthy cabbage. If you’ve made a Corned Beef Dinner, a little left over Corned Beef and the vegetables can be diced up to make this tasty soup. Best of all, you can use some of that broth* from the Corned Beef Dinner, defatted, of course. Either way you go, with bacon as the base flavor or the corned beef, you simply can’t go wrong. I like the corned beef version best as bacon in a soup doesn’t do it for me. On a soup is better, in my opinion, where it stays lovely and crispy/chewy! This soup is basically a glorified tomato soup and is a great, versatile recipe to have on hand. It usually goes over well with those who aren’t happy about a straight, no meat vegetable soup like my Classic Vegetable Soup, Perfected. If you’re a vegetarian, eliminate the meat altogether and use a vegetable stock. Other vegetables can certainly be added here with no problem at all. Carrots, of course come to mind immediately, which I added for the second go around, and the third time I made this (It was that good – three times in the past week) I snuck in a little bit (about 1/2 cup) of sauerkraut left over from my Reuben Sandwiches and Reuben Potstickers. Just a touch and it was fantastic in the soup. Who could have guessed? The name of the soup, Connemara, comes right from the Simon Pearce Restaurant and my guess is that it is simply an affectation! That doesn’t mean that there aren’t many recipes floating around, Irish or not, based off these simple flavors. Using a bit of bacon, cured or not, is a long-standing way to add a bit of flavor and stretch a bit of meat to serve a family. You may recall I mentioned the Simon Pearce Restaurant in my Beef & Guinness Stew post; One of the first Guinness Stews I ever made, way back when, was based off one of their recipes. I did a bit of adapting on this recipe for the soup, streamlining methods, adjusting ingredients – more vegetables, a little less tomato & garlic. I think you’ll love it! We do! Just don’t over cook the cabbage! Serve with muffins, a good, Ballymaloe Soda Bread, Parmesan Toast, or my Crusty Bread (shown in the photos.) A sandwich wouldn’t go wrong, here, either. 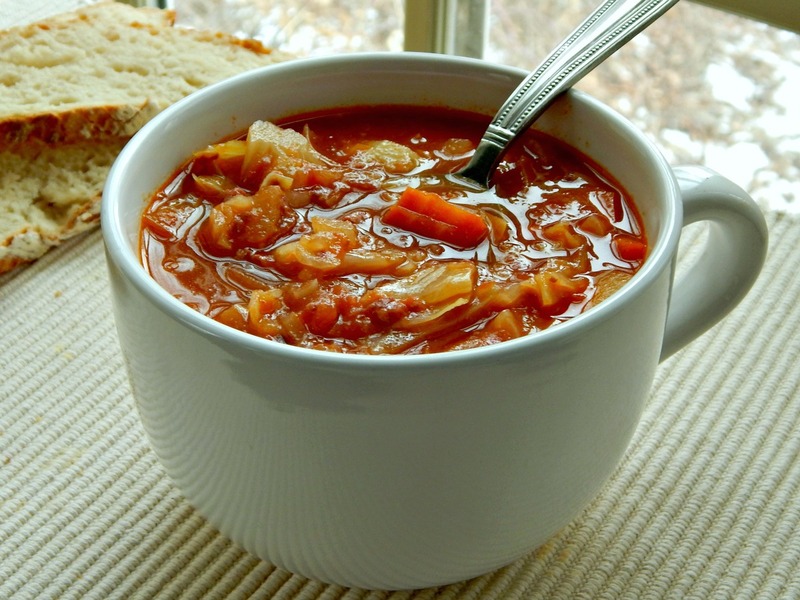 This soup is hearty but low in calories. A dash of vinegar will add a little brightness to this soup, if needed. If making with bacon, in heavy stockpot, cook diced bacon until almost done. Drain grease, add onions and garlic and cook over medium/low heat until onions are tender. If making without, use about a tablespoon of oil to saute the onions in. Add tomato paste and stir in, cooking for a moment or two until it just begins to lightly caramelize. Add potatoes and stock and bring to a boil, simmer until the potatoes are nearly done, 20 to 25 minutes or so. Add the rest of the ingredients (including corned beef if using instead of bacon) and cook another 10 minutes or until cabbage is tender. Add salt and pepper to taste, adjust sugar, if needed to balance. A dash of vinegar brightens any soup! **If you’re making this soup with leftover Corned Beef and the vegetables that are traditional, Potatoes, Cabbage and Carrot, (great leftovers to use are another reason not to cook the holy heck out of your corned beef & veggies) simply saute the onion and garlic, add the tomato paste and cook for a moment, add in the rest of the ingredients and simmer for about 10 minutes. Adjust seasonings to taste. This entry was posted in Click here for Bargain Meals, Click here for Fabulous Food Posts and tagged Bacon, Bargain Meal of the Week, Cabbage, Chicken Stock, Corned Beef, Easy Recipe, Freezes Well, Frugal Hausfrau, Irish, ledtovers, leftover corned beef, Potatoes, Simon Pearce, Soup, Tomatoes. Bookmark the permalink. I’ll be making this with my leftover corned beef this year! This is one of my favorite soups!! I’m crazy about it. Looks delicious! I like its colour and silky, smooth texture! Thanks! The soup was just fantastic. The photo so does NOT do the soup justice, I’m afraid! I’d put it up there as one of the best, and simplest, soups I’ve ever made! 🙂 Thanks! I’m hoping to get a couple more favorites in before summer hits! We’ll see. I see some green grass in my yard, today! Sounds like a wonderfully filling and tasty soup.